Americans turned off by super-PACs: A new survey from the Brennan Center for Justice finds that 65 percent of respondents say they trust the government less since they feel super-PACs have more power than the people. And 26 percent, particularly “communities of color, those with lower incomes, and individuals with less formal education,” say they’re less likely to vote this year because of it. Megadonors step up to the plate: iWatch News reports that seven wealthy men and three cash-heavy organizations have contributed a third of all super-PAC money (and just 46 donors are responsible for $110 million). iWatch has immortalized the top donors with their own interactive trading cards. 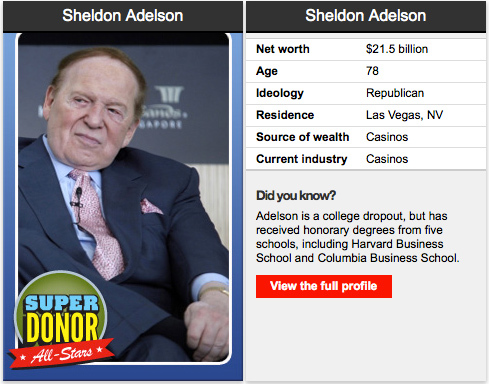 This rookie Sheldon Adelson looks like a keeper. Wall Street bullish on super-PACs: Meanwhile, the Center for Responsive Politics finds that the securities and investment industry continues to blow other industries away in the big money game. Casinos are number three, thanks to Adelson. Coming to a race near you: As Mother Jones’ Andy Kroll reports, a growing number of super-PACs are funneling cash into state and local races in efforts to oust congressional incumbents and influence smaller campaigns. The trend promises to create new problems wth campaign finance disclosure, which is inconsistent and often lacking at the state level. Latest stats from the money war: As supporters of Obama and Mitt Romney max out their legally allowed donations to the candidates, they’re turning to super-PACs to keep the money flowing. So far, Obama and the Democrats have raised more campaign money, but pro-Romney and conservative super-PACs have a cash advantage.